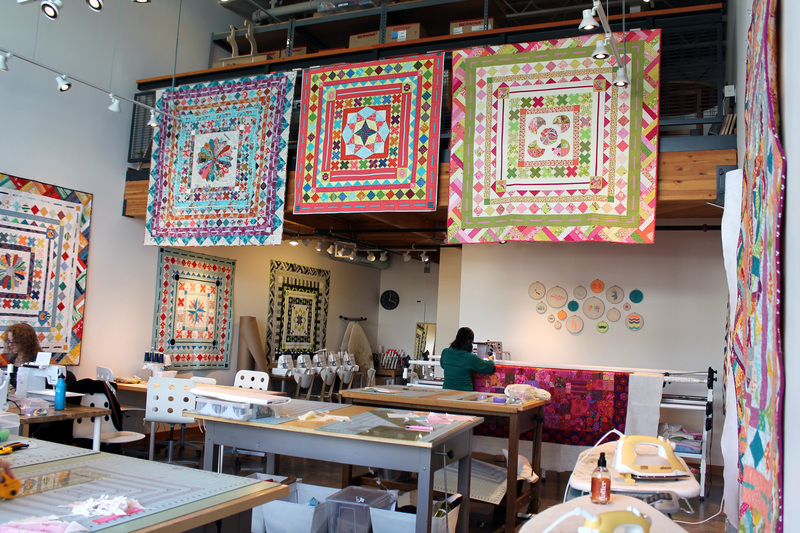 Wednesday I had a wonderful day quilting with some of the members of the Portland Modern Quilt Guild. We had an incredibly productive day and finished 3 quilt tops and also threw a quilt up on the long arm. Once a month Modern Domestic hosts our charity sew day. 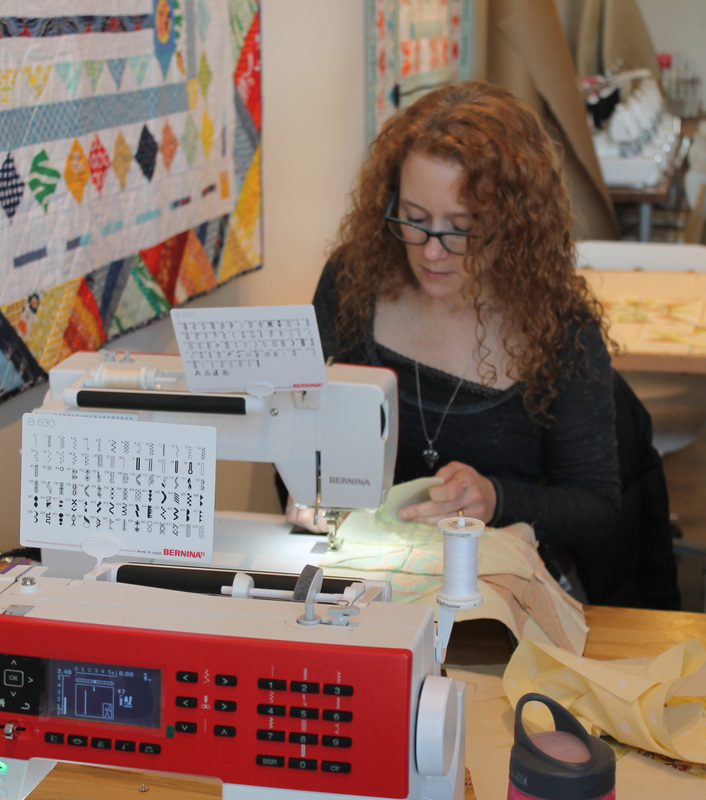 We get to work in their wonderful space and use the amazing Bernina sewing machines in their work room. It is always hard for me to go back to my basic Brother machine after a day of luxury sewing on the Bernina! So what did we get done I hear you ask…. 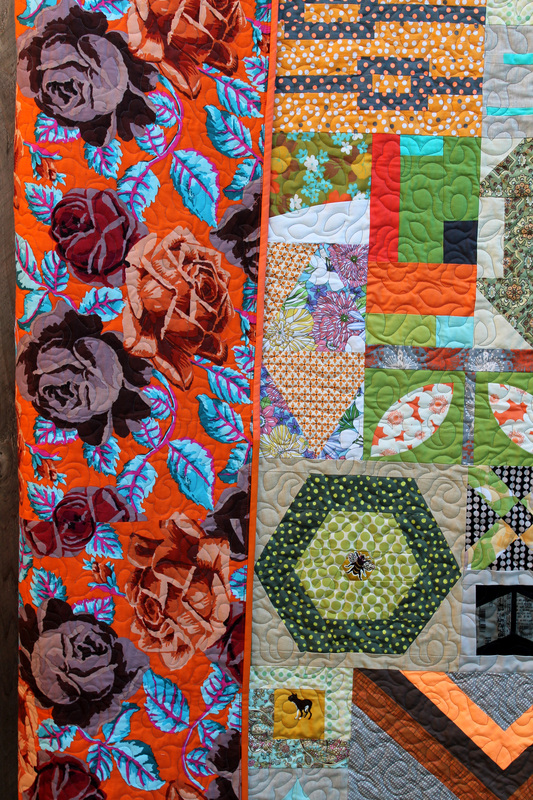 We managed to get this floral beauty quilted on the long-arm machine. Lots of loops and a couple of flowers were stitched into the top by a number of PMQG members. It is really fun to have a top that anyone can have a turn on, so we usually use a simple free motion technique and people can embellish if they are so inclined. And a couple of orphan blocks also became quilt tops. 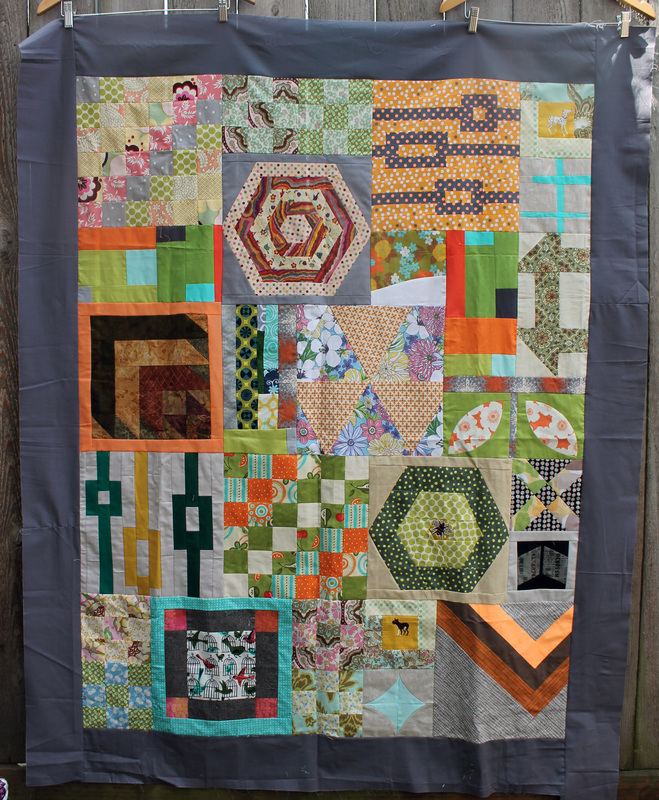 Anne made a sweet little disappearing nine patch…. 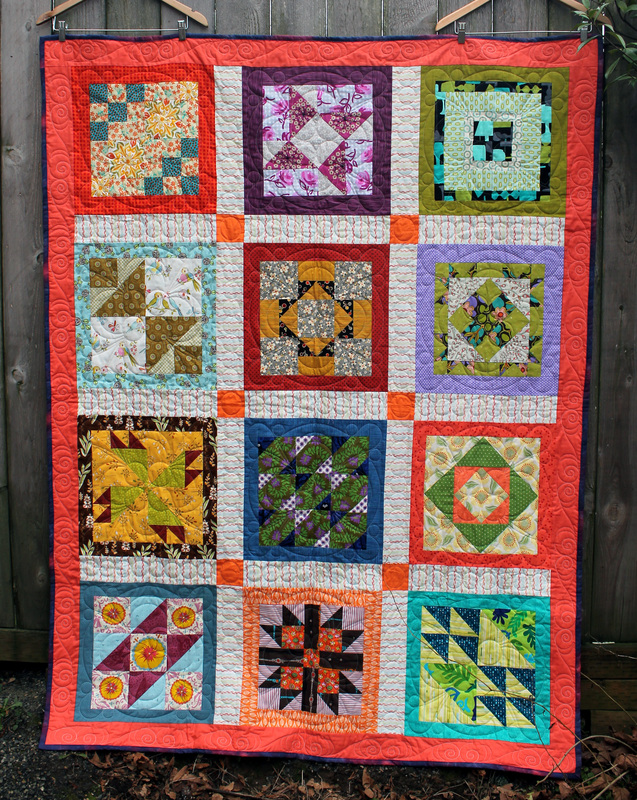 The blocks were orphan blocks donated by the fabulous Elsa Hart, I put the top together and finally the amazing quilting was done by Kazumi Peterson. 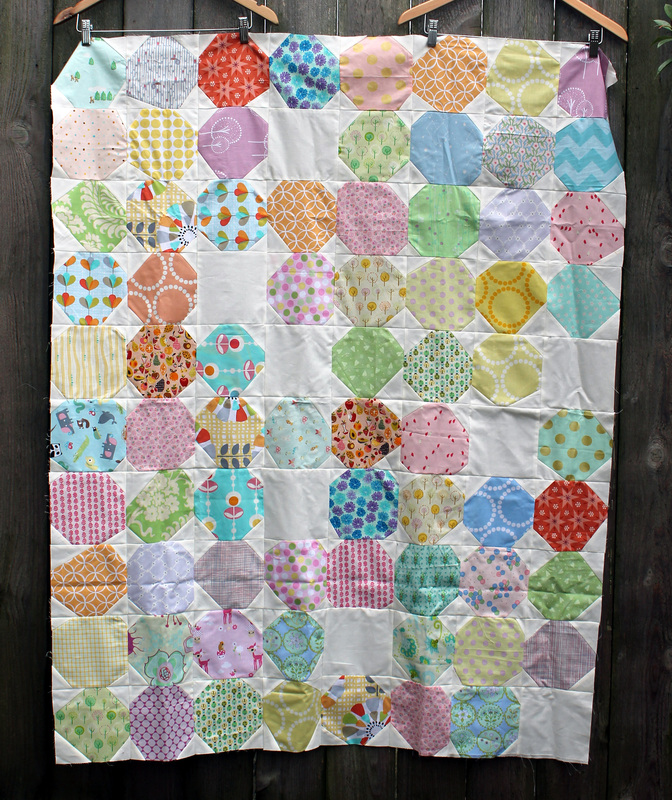 Kazumi quilted this fabulous pattern into ever block with my favorite bubbles pattern in the sashing. 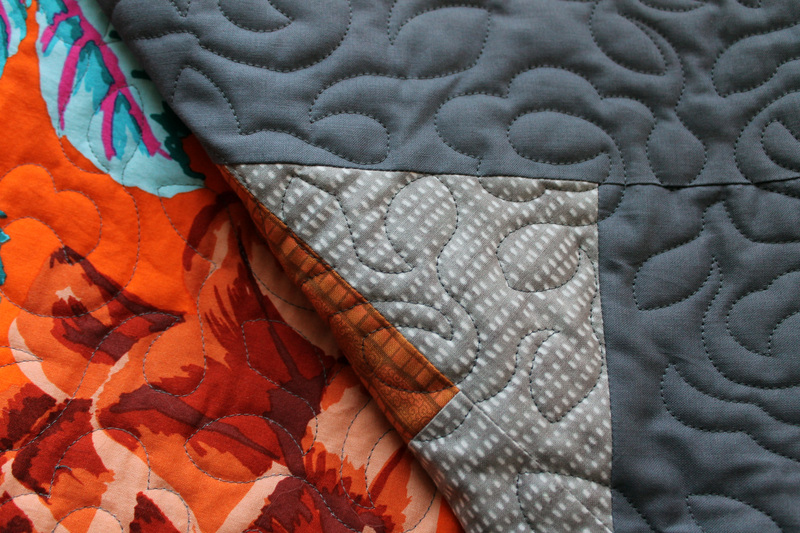 I really love how this quilt turned out and I am realising more and more how important the final quilting process is. 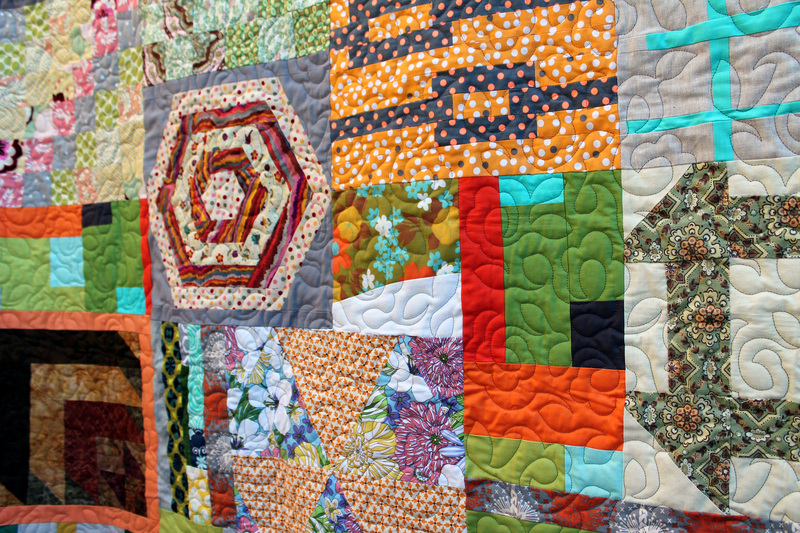 I know most of you already know this, but for me every time I see a quilt properly quilted I am in awe of what those top stitches bring to a project. 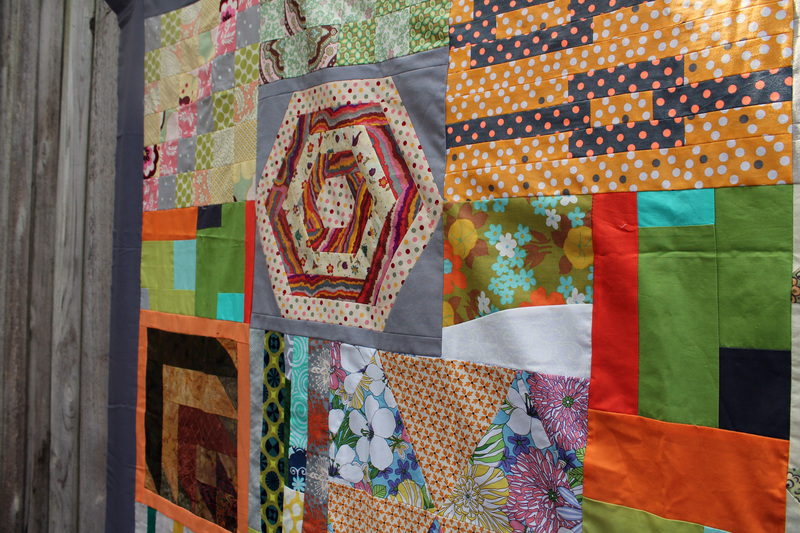 It is spurring me to really tackle my lack of quilting skills this year. At this week’s PMQG meeting we delivered a large stack of quilts to a local Charity, Camp Erin. 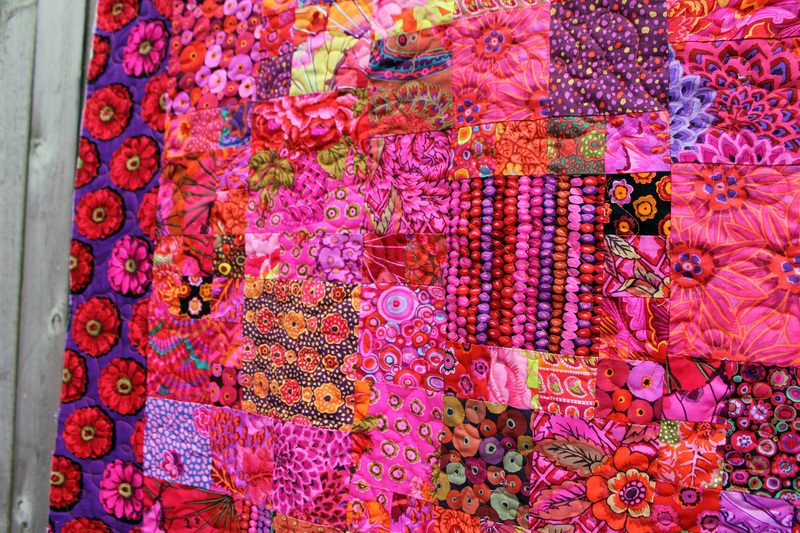 It was so wonderful to see the beautiful quilts that people had created for this charity. 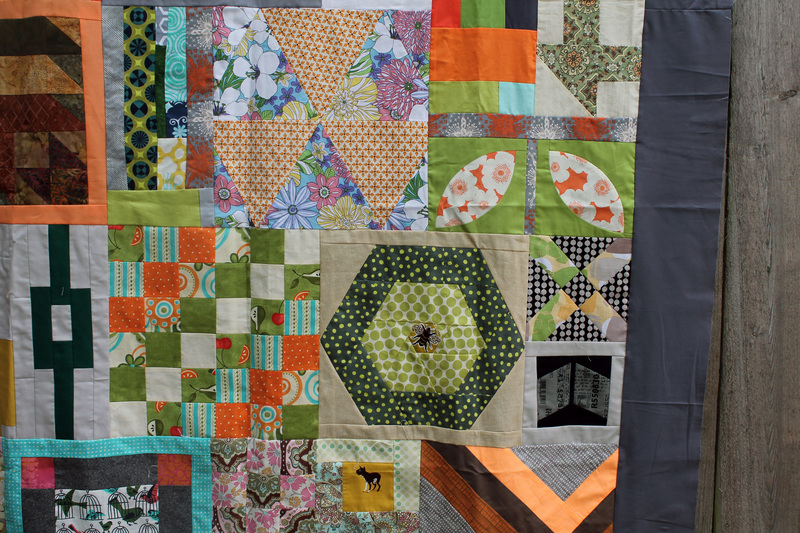 Among those delivered were three quilts made at our Charity Sew Days and the Orphan block sampler I put together…. 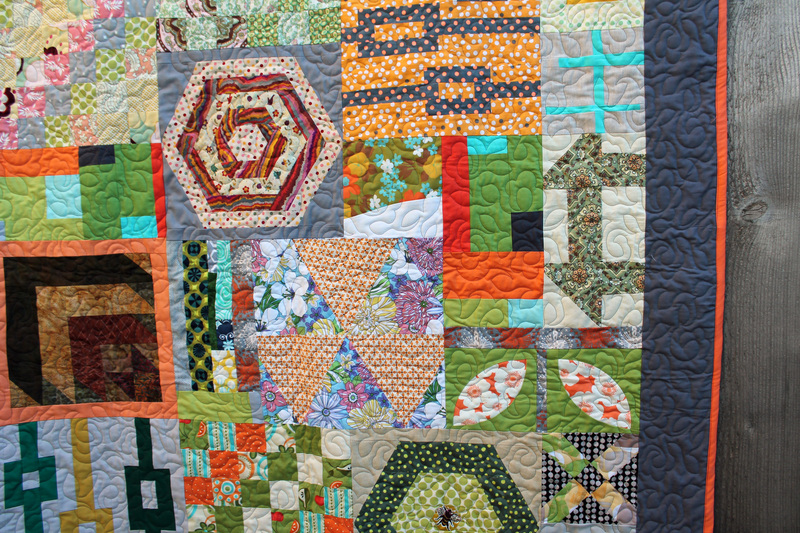 The beautiful quilting was done by PMQG member Kazumi Peterson. 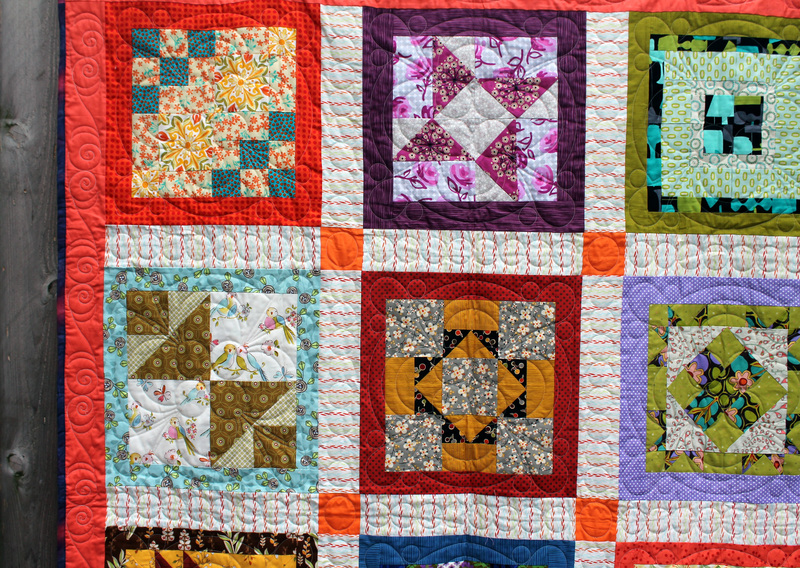 Kazumi added an overall floral motif which went perfectly with the back of the quilt and added such a pretty cohesiveness to the front of the quilt. 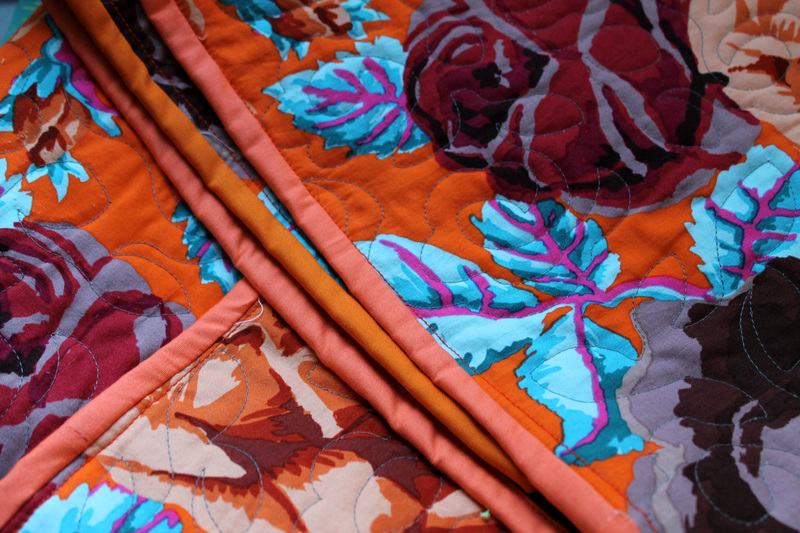 I then finished things off with bright orange binding. 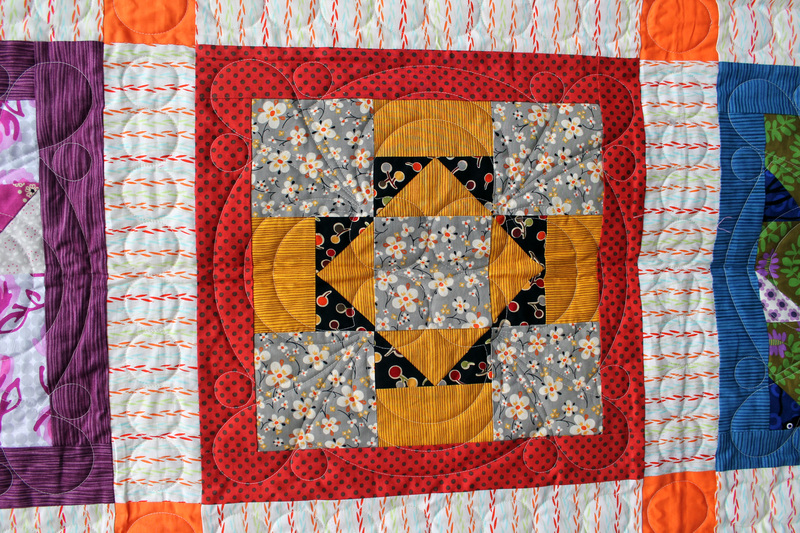 I knew that I had to highlight the orange of the quilt – the blocks and the backing. 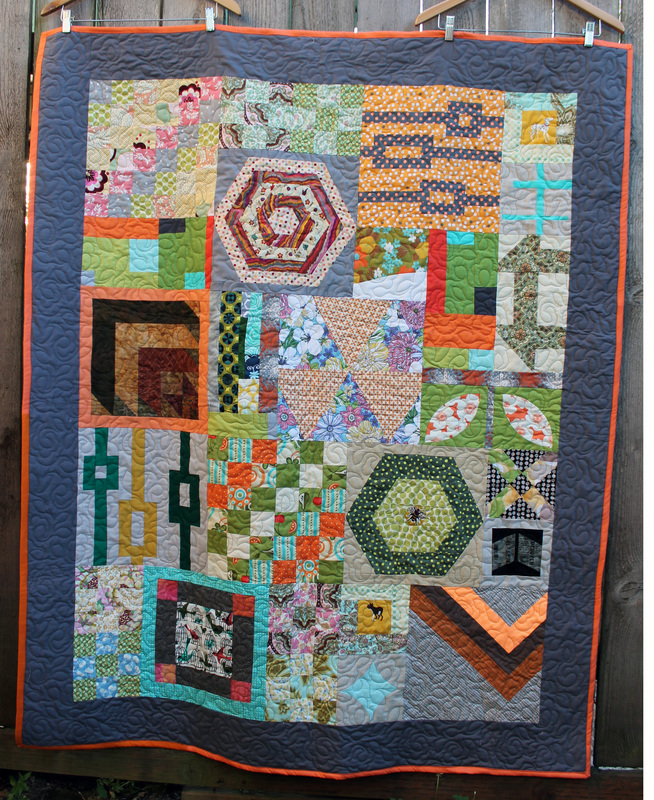 I had originally tried putting an orange border around the quilt, instead of the grey, but I found it fought with the blocks for attention. Orange binding was the perfect compromise. 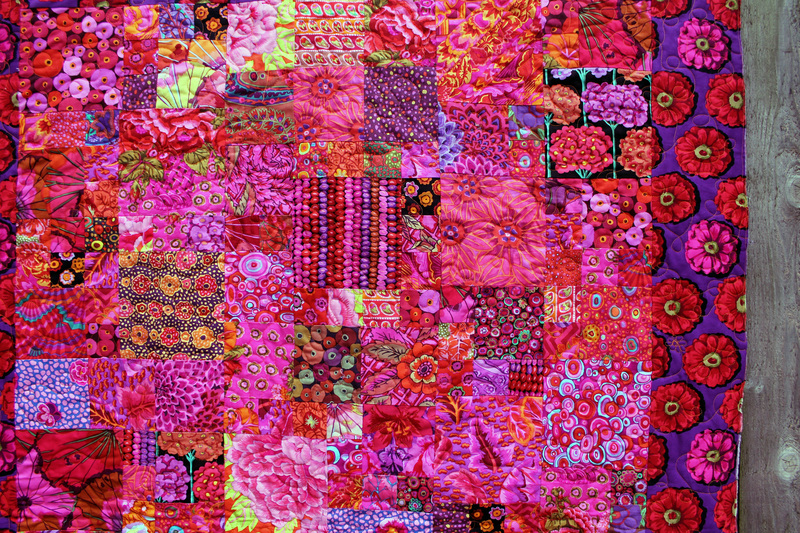 My darling husband had originally called this an ugly quilt but I think he is very wrong. 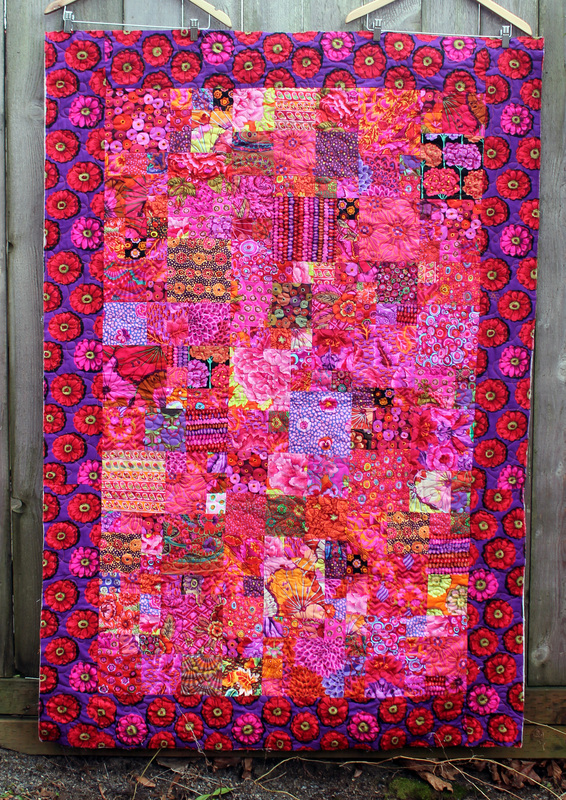 The finished product is fun and bright and pretty…but I am a little biased. This week has been a lost week for me. I got smacked hard by the Flu and have not sewn or been near fabric since Monday..yep I have been that sick! I had so many plans for this week… so many things that needed to get finished. Oh well. Now in defense of this top, it was made using a bunch of unloved orphan blocks from the PMQG charity drive. There are some lovely blocks in the top, but overall the colour scheme is not me. Putting the top together I took apart some blocks, cut up others and generally took liberties. I just loved the challenge of seeing if I could make this work somehow. In hindsight I think I would approach the task differently and use more negative space… putting in solid fabrics instead of some of the cut down blocks. Next time… and there will be a next time because there are more of these orphan blocks. 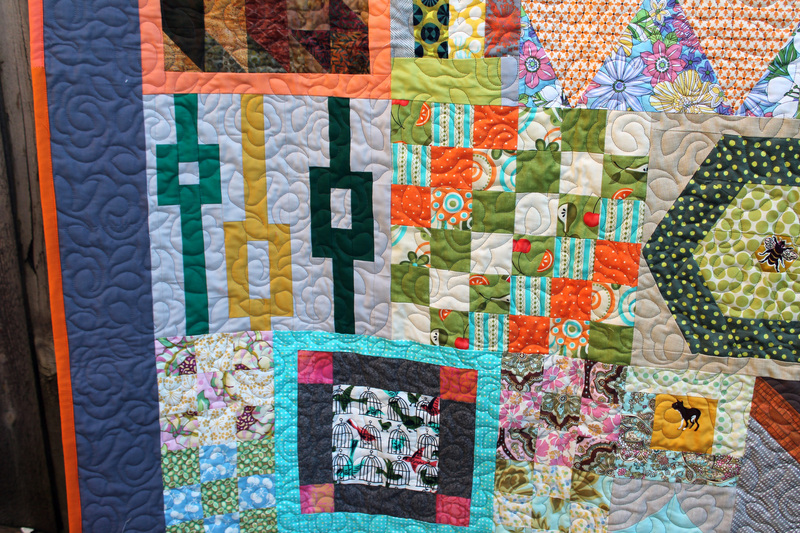 So on this Friday I say it is time for the ugly quilts to come out of the closet. Share your fuglies. Photography them. Facebook them. Instagram them. Let them have their moment in the sun. Okay I am now going back to bed with my tissues and my Dayquil.